I've been on a bit of a Marvel kick over the last week or so - Craig & I have been trying to catch up on all of their films before going to see the Avengers (which I loved, and highly recommend!). 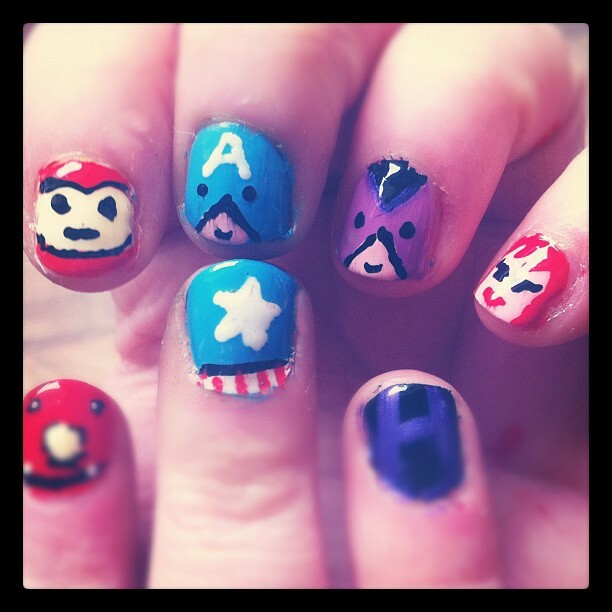 So this nail art seemed like a pretty normal thing to do after a super hero movie marathon! Black Widow (meant to be her belt! ), Hawkeye, Captain America, Iron Man & the Hulk's torso! I had looked online for a bit of inspiration (as I've been in a bit of a leopard-print nail rut), and found loads of amazing designs, but the one that stood out most was this Avengers nail set by MaryMars on etsy. I copied three of her characters and added Hawkeye and Black Widow myself. This was quite tricky to do - took me about an hour (eep!) as it was so fiddly, but I'm really pleased with it. AND if I put my hands together the heads & costumes match up! Sorry about the messy photo ! Oops - forgot to say, best movie ever! Wow your nail fashion really inspired me a lot and really enhanced my knowledge in nail fashion arena...It is lovely to know the fact that nail fashion is flourishing day by day..! !